More bins, greater fines or owner checks - What do you think would help clean up dog mess in Hartlepool? What do you think would help with dog fouling in Hartlepool? New council proposals to help combat dog fouling in Hartlepool have got dozens of you talking on social media. 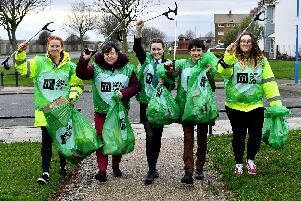 Hartlepool Borough Council's neighbourhood services committee is being asked to bring in four new public space protection orders, one of which could see dog walkers checked for bags to clean up their animal's mess by designated officers. The officers would also have the power to issue fines if owners were not carrying backs when asked. While many of you backed the plans on social media, which also include an extension to a Dog Exclusion Order on the front at Seaton and Dogs on Leads Order at North Cemetery, some made other suggestions of what could be introduced in a fight against the issue. Ashleigh Humble: "Just because someone carries a bag though doesn’t really mean they all pick it up? You’ll just tell everyone this is a thing and everyone will carry a bag in case they get asked and then the irresponsible people still wont pick it up, so it won’t solve the problem at all." Tracey Cafferkey: "It’s about time, the streets are disgusting ... you can’t walk without watching the floor for dog dirt." Emily Blakey: "Perfectly happy to. I always carry at least four with me on a walk. Some for my own dog and some for if I ever see someone try and leave their dog's mess behind." Karen Coussons: "What about a law stating you need to carry a bag if you chew gum because that's a pain and also enforce the litter laws." Paula Melrose: "Brilliant much needed ... hope this is well policed by the council and in all areas of the town." Kay Laverick: "Always have bags so not a problem. Every pocket in every coat I own. More bins would be nice." Julie Kuhlman: "They would be better having wardens looking for people who don't pick up." Andrew MN: "I've never seen anybody enforcing the old rules never mind new ones!" Sharon Lodge: "Get more bins around the town." Emma Kier: "There's plenty of people who pick up the mess and then dump the bags, more bins are needed and enforcing existing rules/laws." Lou Lou: "We’ve been for a couple of walks down the Headland recently, and I have to say that there was dog poo absolutely everywhere along the front. Literally every few metres we took there was more poo. Absolutely disgusting and such a shame because it’s a beautiful part of the world." Julie Butler: "Dog poo town ... time something was done about it ... disgusting." Andrea Burton: "Not a problem. If I'm walking the dog, I always have bags." Ian Griffiths: "The only problem I can see is if your dog has already done his business and you've disposed of it and you used the last one in your pocket." Stephen Lines: "The best one I’ve seen is when they pick it up then throw the bag and it’s contents back on the floor."